Red, green, refactor. The first step in the test-driven development (TDD) cycle is to ensure that your newly-written test fails before you try to write the code to make it pass. But why expend the effort and waste the time to run the tests? If you're following TDD, you write each new test for code that doesn't yet exist, and so it shouldn't pass. But reality says it will happen--you will undoubtedly get a green bar when you expect a red bar from time to time. (We call this occurrence a premature pass.) Understanding one of the many reasons why you got a premature pass might help save you precious time. Running the wrong tests. This smack-your-forehead event occurs when you think you were including your new test in the run, but were not, for one of myriad reasons. Maybe you forgot to compile it, link in the new test, ran the wrong suite, disabled the new test, filtered it out, or coded it improperly so that the tool didn't recognize it as a legitimate test. Suggestion: Always know your current test count, and ensure that your new test causes it to increment. Testing the wrong code. You might have a premature pass for some of the same reasons as "running the wrong tests," such as failure to compile (in which case the "wrong code" that you're running is the last compiled version). Perhaps the build failed and you thought it passed, or your classpath is picking up a different version. More insidiously, if you're mucking with test doubles, your test might not be exercising the class implementation that you think it is (polymorphism can be a tricky beast). Suggestion: Throw an exception as the first line of code you think you're hitting, and re-run the tests. Unfortunate test specification. Sometimes you mistakenly assert the wrong thing, and it happens to match what the system currently does. I recently coded an assertTrue where I meant assertFalse, and spent a few minutes scratching my head when the test passed. Suggestion: Re-read (or have someone else read) your test to ensure it specifies the proper behavior. Invalid assumptions about the system. 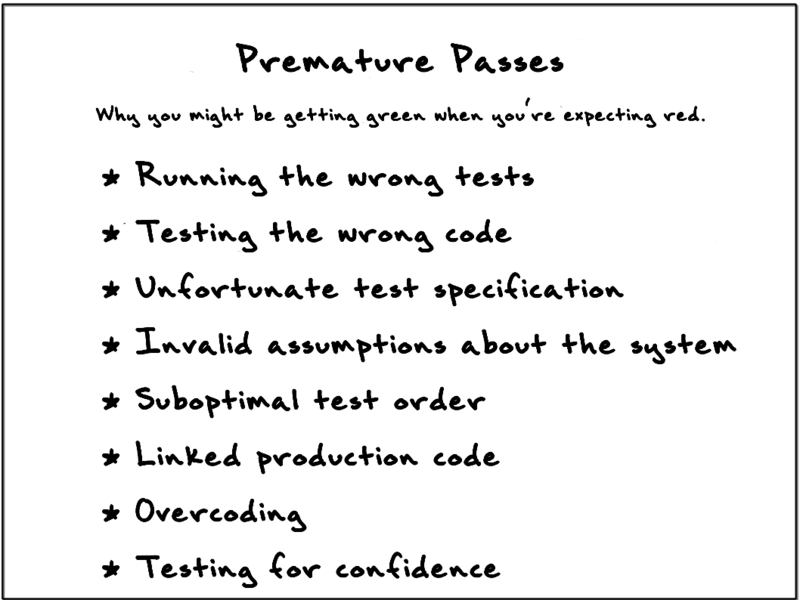 If you get a premature pass, you know your test is recognized and it's exercising the right code, and you've re-read the test... perhaps the behavior already exists in the system. Your test assumed that the behavior wasn't in the system, and following the process of TDD proved your assumption wrong. Suggestion: Stop and analyze your system, perhaps adding characterization tests, to fully understand how it behaves. Suboptimal test order. As you are test-driving a solution, you're attempting to take the smallest possible incremental steps to grow behavior. Sometimes you'll choose a less-than-optimal sequence. You subsequently get a premature pass because the prior implementation unavoidably grew out a more robust solution than desired. Suggestions: Consider starting over and seeking a different sequence with smaller increments. Try to apply Uncle Bob's Transformation Priority Premise (TPP). Linked production code. If you are attempting to devise an API to be consumed by multiple clients, you'll often introduce convenience methods such as isEmpty (which inquires about the size to determine its answer). These convenience methods necessarily duplicate code. If you try to assert against isEmpty every time you assert against size, you'll get premature passes. Suggestions: Create tests that document the link from the convenience method to the core functionality, demonstrating them. Or combine the related assertions into a single custom assertion (or helper method). Overcoding. A different form of "invalid assumptions about the system," you overcode when you supply more of an implementation than necessary while test-driving. This is a hard lesson of TDD--to supply no more code or data structure than necessary when getting a test to pass. Suggestion: Hard lessons are best learned with dramatic solutions. Discard your bloated solution and try again. It'll be better, we promise. Testing for confidence. On occasion, you'll know when you think a test will generate a premature pass. There's nothing wrong with writing a couple additional tests: "I wonder if it works for this edge case," particularly if those tests give you confidence, but technically you have stepped outside the realm of TDD and moved into the realm of TAD (test-after development). Suggestions: Don't hesitate to write more tests to give you confidence, but you should generally have a good idea of whether they will pass or fail before you run them. Never skip running the tests to ensure you get a red bar. Pause and think any time you get a premature pass. You can find many good blog posts on what to name your tests. 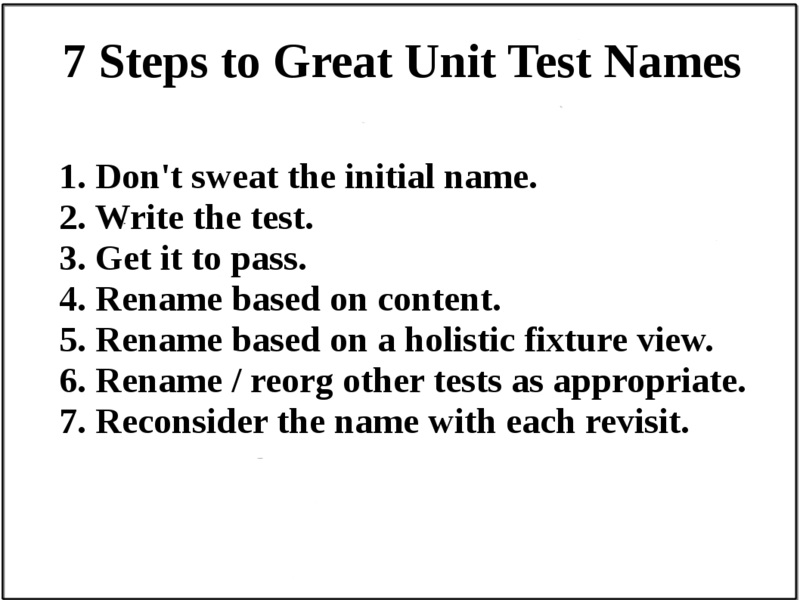 We present instead an appropriate strategy for when and how to think about test naming. Don't sweat the initial name. A bit of thought about what you're testing is essential, but don't expend much time on the name yet. Type in a name, quickly. Use AAA or Given-When-Then to help derive one. It might be terrible--we've named tests "DoesSomething" before we knew exactly what they needed to accomplish. We've also written extensively long test names to capture a spewn-out train of thought. No worries--you'll revisit the name soon enough. Write the test. As you design the test, you'll figure out precisely what the test needs to do. You pretty much have to, otherwise you aren't getting past this step! :-) When the test fails, look at the combination of the fixture name, test method name, and assertion message. These three should (eventually) uniquely and clearly describe the intent of the test. Make any obvious corrections, like removing redundancy or improving the assertion message. Don't agonize about the name yet; it's still early in the process. Get it to pass. Focus on simply getting the test to pass. This is not the time to worry about the test name. If you have to wait any significant time for your test run, start thinking about a more appropriate name for the test (see step 4). Rename based on content. Once a test works, you must revisit its name. Re-read the test. 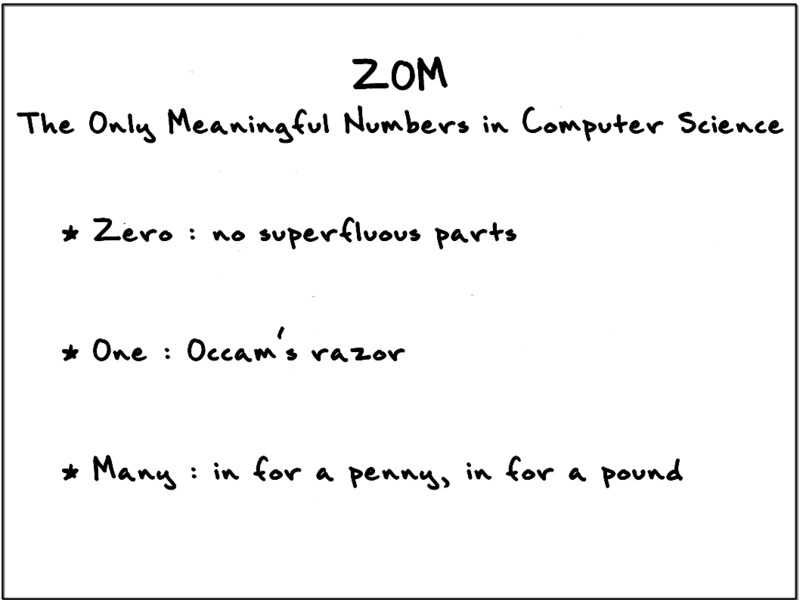 Now that you know what it does, you should find it much easier to come up with a concise name. If you had an overly verbose test name, you should be able to eliminate some noise words by using more abstract or simpler terms. You may need to look at other tests or talk to someone to make sure you're using appropriate terms from the domain language. Rename based on a holistic fixture view. In Eclipse, for example, you can do a ctrl-O to bring up an outline view showing the names for all related tests. However you review all the test names, make sure your new test's name is consistent with the others. The test is a member of a collection, so consider the collection as a system of names. Rename and reorganize other tests as appropriate. Often you'll question the names of the other tests. Take a few moments to improve them, with particular focus given to the impact of the new test's name. You might also recognize the need to split the current fixture into multiple fixtures. Reconsider the name with each revisit. Unit tests can act as great living documentation -- but only if intentionally written as such. Try to use the tests as your first and best understanding of how a class behaves. The first thing you should do when challenged with a code change is read the related tests. The second thing you should do is rename any unclear test names. The test names you choose may seem wonderful and clear to you, but you know what you intended when you wrote them. They might not be nearly as meaningful to someone who wasn't involved with the initial test-writing effort. Make sure you have some form of review to vet the test names. An uninvolved developer should be able to understand the test as a stand-alone artifact - not having to consult with the test's author (you). If pair programming, it's still wise to get a third set of eyes on the test names before integrating. Unit tests require a significant investment of effort, but renaming a test is cheap and safe. Don’t resist incrementally driving toward the best name possible. Continuous renaming of tests is an easy way of helping ensure that your investment will return appropriate value.